In South East Florida, fall and winter are among the best times of year to use your hot tub. The weather is a little cooler, and soaking in that soothing warm water – day or night – is incredibly relaxing. But before you can enjoy it, there’s something you have to take care of. That heavy, bulky cover. You know you have to have one – it keeps the heat in and dirt and debris out, keeping your hot tub clean and helping it run efficiently. But boy is it heavy and awkward to move. When someone else is home you can ask for help but if you’re home alone there’s only one thing you can do. You manage to fold back half of the cover. You reach around and drag the cover off the rest of the way, flopping it onto the patio. It’s not good for the cover, but what else are you supposed to do? That thing is heavy, and awkward to move around. But there IS a solution – a cover lifter! These handy gadgets attach to your hot tub and make it incredibly easy to remove your cover, all by yourself – no super-strength required. Cover lifters come in three different types: Manual pivot, shelf-style and hydraulic-assisted; and they install in one of these ways: Under, side, top and bottom mount. 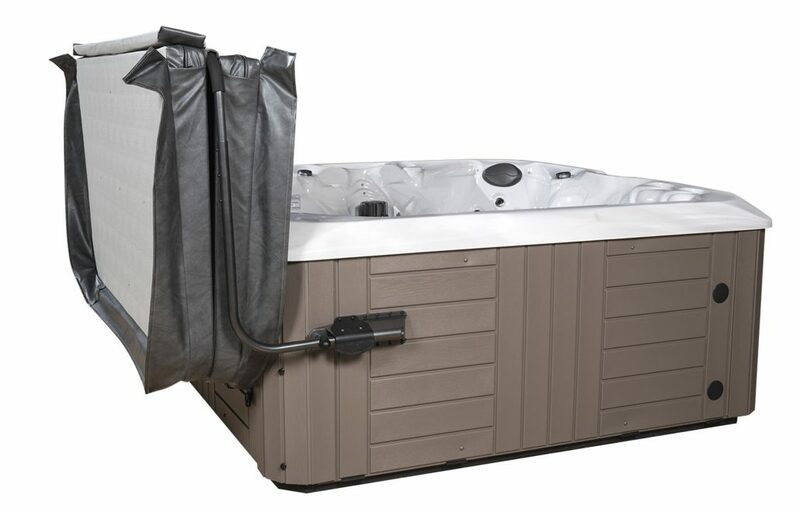 The type you choose will depend on your preferences and budget; the installation will depend on the cover you select, and the way your hot tub is installed. To choose a cover lifter, you need to know how much space you have behind your spa, and on the side where the lifter will install. Stop by our showroom and we can help you select the cover lifter that’s perfect for your spa and installation needs. Then, the next time you want to enjoy a soothing hydromassage and you’re home alone – no worries! You can lift that cover right off. And if you want to pretend like you’re as strong as a superhero while you do it – that’s OK. No one else will ever know. Hot tub buyer beware: avoid traveling shows It’s a Big Green Egg Thanksgiving!